CasinoLand | A whole new online casino world opens up! A new world open to players is CasinoLand. It encompasses everything a good casino should be. As a result, it attracts players who know a thing or two about online casinos and the benefits of joining one. Having been designed for experienced players, it serves as new territory for many of them all over the world. The games offered are all compatible with desktop computers as well as mobile devices. This makes the land ideal for those busy players who want to be able to access their favourite games wherever they go. 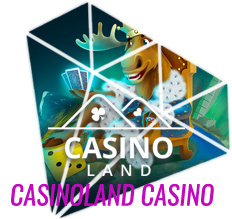 Since CasinoLand is serious about welcoming new players, they are rewarded with bonuses on their first four deposits. The first is a full deposit match and the other three are half of the deposit amount. The casino does impose a maximum amount for each deposit match, but most players don’t mind this limitation. From time to time you are also able to find a new casino offer at this site. Just be on the lookout at the “promotions” page. It is not out of the realm of possibilities that new or existing players may be awarded with free spins. These are sometimes added to the bonuses new players get on their first few deposits. At any given time the casino may choose to offer free spins as part of a temporary promotional bonus. If they are awarded to players, it becomes necessary to spend the money won from free spins on the casino’s selection of video slot machines. Another way to get free spins is by moving up the ranks of the CasinoLand loyalty club. Classic, video and jackpot slots make up the selection offered at CasinoLand. Examples of classic slot machines offered include Irish Gold, Lucky Diamonds and Mystery Joker. Some of the jackpot video slots offered are Wow Pot, Major Millions Progressive and Mega Gems. Other choices in games include Blackjack, Roulette, video poker, table and live casino games. Variations of Blackjack offered include Diamond, Classic and Pro. There are also advanced high and lo limit versions of Roulette offered. The small handful of video poker games offered include Jacks or Better and Deuces Wild. Super Wheel, Red Dog and Punto Banco are also offered. The live dealer casino games offered include Dream Catcher and Three Card Poker. While the casino’s slot machine games can be played for fun, real money must be used when betting on live dealer games. In addition, players must be signed into their account in order to join a game with a live dealer. There are many ways to contact customer support at CasinoLand. Since the casino caters to players in so many countries, there are phone numbers for various countries as well as an international phone number. Players can also initiate a live chat with a customer support representative. Alternately, they can send a message and wait for a response. For many players, the frequently asked questions section has all of the information that they need. Players can make payments to their casino account by using Visa, MasterCard, Skrill, EcoPayz, Ukash, Trustly and Paysafecard, among others. Deposits are always free to make and are made available to players immediately. Many players make it a point to fund their account so that they can excel in the casino’s loyalty club. Every newly registered player starts at the bronze level of the club and is encouraged to work their way up the ranks. As they move through silver, gold and platinum, players enjoy increased benefits. The included progress bar lets players easily see how close they are to reaching the next level of the club. Anytime that a player spins the reels of any of the casino’s slot machines, their progress bar will grow. However, this only applies to those who are betting with real money. A full progress bar triggers free spins, the amount of which depends on their current loyalty club status. Players do not have to use these free spins immediately, as the spins will stay credited to their account until they are ready to try their luck for free. When players enter the world of CasinoLand they are treating themselves to an escape from reality. The games available to them, as well as the exciting promotions to help them get started. Joining the loyalty club is something that many players take pride and will use as an excuse to keep returning to the casino. The entertainment value the casino offers is simply amazing. Players will find that the selection of games keeps them interested in remaining active with the casino. With the option to play games for fun or real money, each experience can be custom tailored to individual casino members. CasinoLand provides players with a whole new world to explore; one that they can call their own. Its goal is simply to provide high-quality entertainment.